Our 42" Round Picnic Tables (with Umbrella Hole) are constructed from fiberglass with heavy-duty steel frames, ensuring a long life of commercial outdoor use. As a leader in the industry, we're committed to continually developing product innovations. Using an efficient manufacturing process, we produce products well known for being durable, long-lasting, and maintenance-free, assuring every furniture item meets the needs of your restaurant. All of our furnishings are available in a variety of finish options so that they will perfectly compliment your restaurant setting. There are 15 different color finishes to choose from. The 42" Round Picnic Table with Umbrella Hole will make a wonderful addition for your outdoor or indoor restaurant needs. 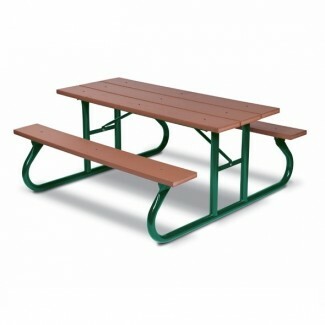 Our Site Furnishing Picnic Tables Collection has a lead time of 3 - 6 weeks from the time your order is processed.